BJ's nocabbages: Is Inflation derailing the India Growth Story? Inflation has been around for several years now. In fact, the last few years have seen double digit inflation rate that has severely impacted both producers (through rise in cost of raw materials) and consumers (because of increase in retail price). In the case of producers, rising prices have eroded competitiveness of their products while consumers are seeing a fall in the general quality of life, including in their standard of life. 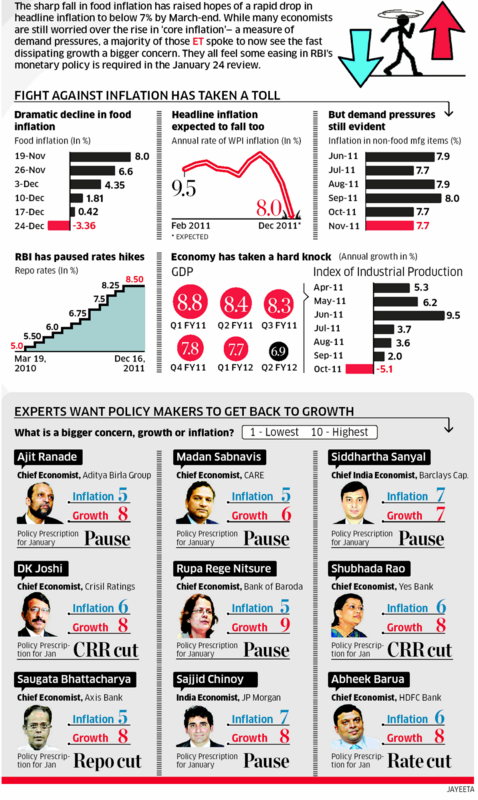 Today's Economic Times has an interesting infographic on inflation in India and how it has impacted the economic growth. It also carries views of experts on what they want to steer the Indian economy on the path to consistent growth. In India, the slowdown in GDP growth witnessed over the last two quarters is likely to extend in the coming fiscal year noted the World Bank's India Economic Update.